“I was working at Snakes and Lattes and started talking to a customer about the computability of a game he was playing,” says Frosst, a University of Toronto Woodsworth College alumnus who, at the time, was in the second-year of his undergraduate studies in the department of computer science. That fateful conversation led to an introduction to York University’s John Tsotsos, a former U of T associate chair of computer science, and a position as an undergraduate research assistant. 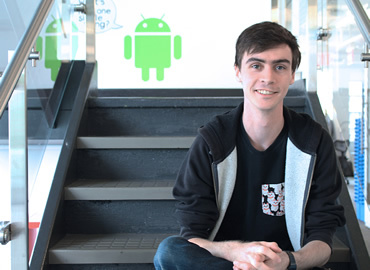 Not long after, Frosst was striking up similar conversations with his U of T professors and undertaking several independent research studies – a path that led him to his current gig at Google Brain. On Nov. 3, Frosst will be a panelist at the Start AI conference at the MaRS Discovery District. Organized by U of T’s Undergraduate Artificial Intelligence Group, it’s the organization’s first-ever conference to focus on opportunities in the AI field for bachelor’s graduates. Over 300 people from across the province are expected to attend. While Frosst says those early independent research studies at U of T “didn’t get huge results,” he nevertheless described the overall experience as invaluable. “I learned a lot about what it means to set up an experiment and how to talk to people about what you’re working on,” he says. As for Google Brain Toronto, Frosst is now part of a 10-person research team led by U of T University Professor Emeritus Geoffrey Hinton. Hinton, a vice president and fellow at Google, is widely known as the “godfather of a deep learning,” a branch of artificial intelligence that trains computers to reason like humans. He will be Start AI’s keynote speaker. At Google Brain, Frosst and his colleagues do fundamental research that seeks to improve AI’s neural networks. This doesn’t mean simply making AI better at solving problems, or improve its usability in the next app, he says, but improving the neural networks themselves – which, in turn, creates a host of new problems that need solving. In a paper published last year, Hinton, Frosst, as well as lead author and fellow Google researcher, Sara Sabour, who has a master’s in computer science at U of T, showed off what they believe is the next evolution: capsule networks. It immediately caused a stir. Frosst says Sabour’s project intends to define an entirely new structure for neural nets. “Let's say you've trained a network to detect cats or dogs in an image,” explains Frosst. “A regular convolutional network might have a unit that detects the eye of a cat, or the ear of a cat, or the tail of a cat. Frosst says a capsule network, by contrast, looks for agreement between features – in this instance, a cat’s features – as opposed to just the presence of them, which he says turns out to be pretty useful for a number of problems, including object recognition. However, capsule networks will need to perform faster, and be easier to use, to reach their true potential. At Start AI, Frosst will take part in a panel discussion on AI hype versus reality. Frosst is also part of an indie band called Good Kid, whose members are all U of T alumni working tech industry roles at Google, Shopify and Snapchat. The band just reached 1.5 million streams on Spotify. Suffice it to say, Frosst isn’t planning to return to academia any time soon. “I really enjoyed my undergrad at U of T,” he says. “It was a super fun time. I miss elements of it, giving tutorials, office hours and talking to people. And taking classes outside of computer science in history and philosophy.